Part one in this series raised the possibility that George Adamski was fooled into believing that Venus was the origin of Orthon, the flying saucer occupant he met in December 1952. There are a number of aspects about Adamski’s 1952 contactee case that leads to the conclusion that Orthon was part of a German secret space program, and/or linked to an extraterrestrial alliance that had actively helped Nazi Germany leading up to and during World War. The flying saucers that Adamski had photographed very closely resembled the Haunebu antigravity craft that had allegedly been developed in Nazi Germany. The exact specifications of the Haunebu craft contained in Nazi SS files were first released by Vladimir Terziski, an engineer and former member of the Bulgarian Academy of Sciences. The Nazi files were released after the collapse of the Warsaw Pact on February 25, 1991, and came into Terziski’s possession after he had immigrated to the US in 1984. 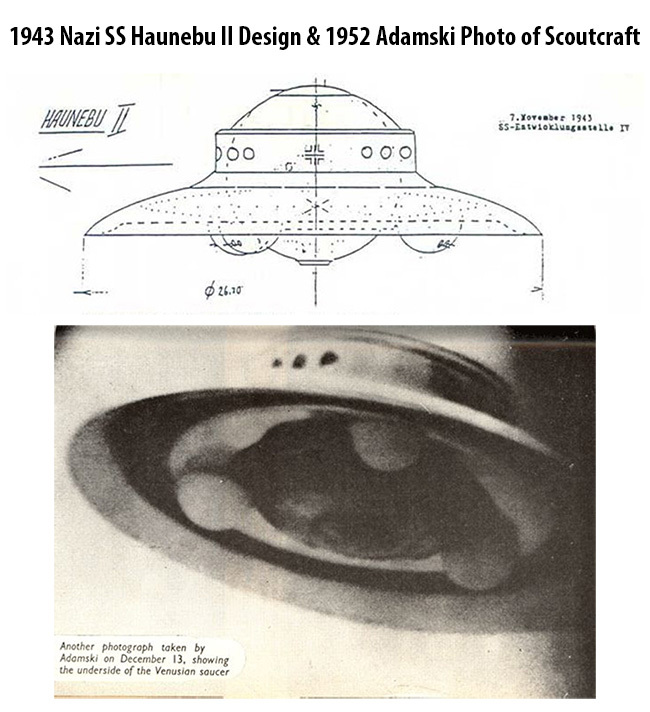 Below is a comparison of a 1943 design of a Haunebu II flying saucer craft being developed by the Nazi SS for the war effort, and a scout craft photographed by Adamski in December 1952. Note the major point of difference is that the Nazi craft had some kind of artillery device signifying an attempt at weaponizing flying saucer craft for the war effort. Indeed, in 1950, articles appeared in major newspapers around the world citing interviews with prominent Italian and German scientists who confirmed that the Axis powers had been cooperating in a secret effort to weaponize flying saucers. The configuration of the 1943 Haunebu craft is so similar to those Adamski photographed in 1952 as to suggest that if not the same type of vehicle, then whoever developed the latter was at a similar technological level of development as the Germans in the mid-1940’s. Yet, if Orthon was from Venus, and part of an advanced interplanetary association as discussed by Zirger in his book, We Are Here: Visitors without a Passport (2017), then how could the first generation of Nazi flying saucers have been almost identical to craft used in a far more technologically evolved interplanetary society? One explanation is that extraterrestrials had provided craft to Nazi Germany so that they could be reverse engineered. This is supported by information provided by former aerospace engineer, William Tompkins, who says that US Navy spies had reported during their debriefings at Naval Air Station, San Diego, from 1942 to 1946, that the Germans had been given over a dozen models of operational antigravity spacecraft. The Nazis were furiously attempting to reverse engineer these for the war effort, but were ultimately unsuccessful as far as their European based programs were concerned. Tompkins’ information helps us understand that the 1943 Haunebu II diagram was an attempt by the Nazis to weaponize an antigravity flying saucer, which had been given to Hitler’s Third Reich by extraterrestrial allies as a result of a secret agreement. Therefore, Orthon may have only pretended to be from Venus, in order to hide the existence of a German space program that had survived World War II. Orthon only communicated with Adamski non-verbally using sign language during the 1952 Desert Center encounter. Adamski explained in a lecture that Orthon “spoke mostly in a strange dialect wholly unintelligible to Adamski” (We Are Here, Kindle Location 903of 5403). Was the “strange dialect” High German which, as mentioned in Part 1 of this series, Reinhold Schmidt identified as being used by the spacecraft occupants during his 1957 contact experience. Schmidt had a German background and was also taught High German at school, but Adamski may have not been able to identify German dialects since his background was Polish-American. Alternatively, Adamski may have known that Orthon spoke German, but was not allowed to publicly reveal this for national security reasons. It has long been rumored that after each of his extraterrestrial contact experiences, Adamski was secretly flown from California to the Pentagon by the U.S. Air Force where he was debriefed about his contacts. In May 2009, a rare video was released containing interviews with various witnesses who knew about Adamski and his secret debriefings at the Pentagon. The witnesses confirmed that Adamski possessed a military ordnance ID card which allowed him access into the Pentagon. The military ID was witnessed by several people, who had worked in various Department of Defense positions. Among the witnesses was William Sherwood who had previously worked for the U.S. Army Ordnance Department and possessed his own Ordnance pass. Sherwood saw Adamski’s Ordnance pass and confirmed its authenticity. Sherwood’s and other supporting testimony gives credence to rumors that Adamski was indeed secretly briefing the Pentagon about his extraterrestrial contacts. 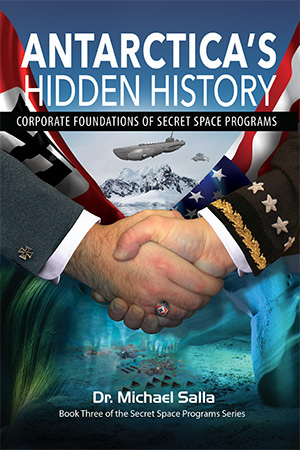 In 1952, the Pentagon was well aware that a German Space Program had survived World War II and had begun operating over U.S. territory. Senior Pentagon officials wanted this to be kept secret. Consequently, it is very possible that Adamski was told not to say anything about Orthon speaking German to prevent the public from learning the truth. The possibility that Orthon was part of a German Secret Space Program, based in Antarctica, which was operating over U.S. territory, is strengthened by events leading up to the 1952 Washington Flyover. This occurred only months before Adamski’s encounter with Orthon. 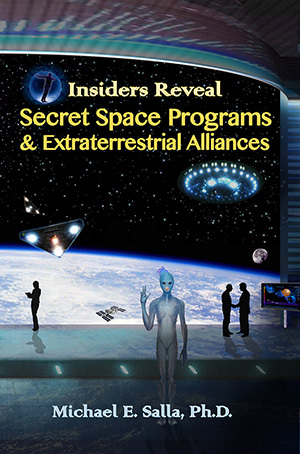 ← Did Extraterrestrials from Venus Make Contact in 1952?